Excitement around augmented reality is taking the industry by storm. There have been some significant new trends in the games industry over the last year – not least the rise of augmented reality. Apple and Google are both developing ARKit and ARCore to usher in a wave of AR apps, popularised by Niantic’s Pokemon GO. But there were lots of other trends too – as well as a few things that stayed the same as some of the bigger players strengthen their grip on the market. To take a deeper look into the market and see what industry professionals themselves think are the biggest trends, we conducted a survey of the business at large to gauge the temperature of the sector, and find out what’s hot and what’s not. Our survey included more than 300 people from the mobile games industry based in countries all around the world, including the UK, USA, Canada, Nordic countries, India, China, Japan, South Korea and more. 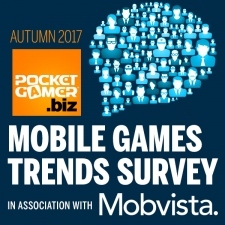 You can read the full Mobile Games Developer Trends Survey Autumn 2017 report in association with Mobvista right here. Not registered? You’ll need to sign up to the Steel Media Business Network to read the full report for free. It’ll appear under ‘Your Downloads’ in the left column of your profile. As mentioned, excitement around augmented reality is taking the industry by storm. Reflecting this, 44.4% of our survey respondents cited AR as the clearest trend in the sector throughout 2017. Virtual reality isn’t proving as hot right now however. 29.6% of respondents believe the technology has been a hot trend for 2017, but that’s down from the 38.2% in our 2016 Winter survey. (You can access the previous survey in your Steel Media Business Network account). Other trends include real-time competitive gaming (40.8%) and the growth of influencer market (34.9%). In fact, the impact of influencers can be seen dramatically from our responses. 33.1% of respondents cited people watching games via online platforms as the fourth most prominent trend in the industry, while 28.2% noted the rise of online influencers making an impact. It’s a good thing we launched our new influencer-focused site InfluencerUpdate.biz to keep the industry informed on this exciting new sector. Excitement around location-based gaming has cooled in 2017. Following the smash hit that was Pokemon GO, few have even attempted something similar, and there’s been no similar – or even close to – success since. This has resulted in just 25.1% of respondents citing location-based gaming as a hot trend for 2017, down from 48% in our 2016 Winter survey. You can read the full Mobile Games Developer Trends Survey Autumn 2017 report in association with Mobvista right here by signing up to the Steel Media Business Network.